The definition of Osmosis is; the diffusion of a solvent (frequently water) through a semi-permeable membrane. I always describe this to my customers as “natures other way to clean water”. A tree for example, absorbs water from the ground up into its membrane, through the branches to the leaves and falls, purified, to the ground. Ex: Have you ever watered a plant and returned to see tiny droplets on the leaves? How can this help me with my water at home? With reverse osmosis, water is forced through a membrane, and is absorbed from the by the membrane. 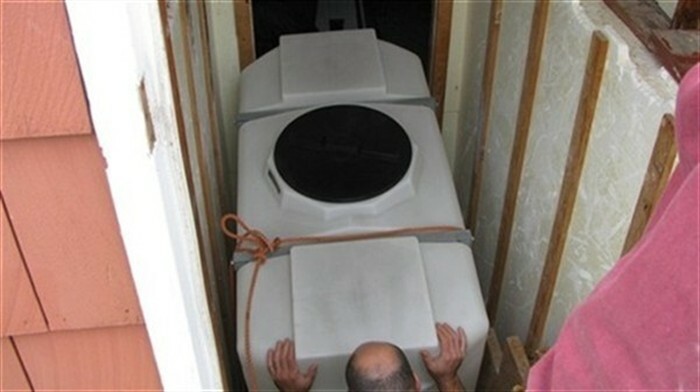 During this process, the water loses most of its unwanted contents and is placed in a designated area to be later used. What happens to the unwanted material? 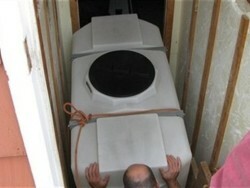 The unwanted material is flushed to a drain usually at a ratio of 4:1. 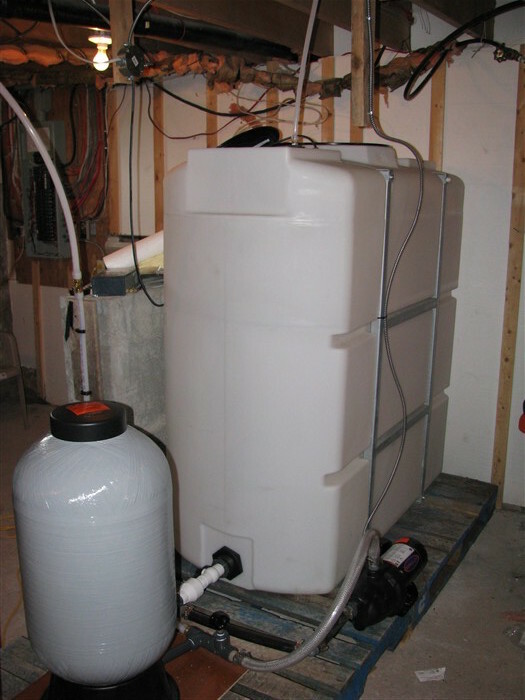 This sounds wasteful but it does render the water useful for drinking and in larger or whole house units can give you better than spring water quality for general household use. With a whole house system, there is need for pre-filtration, a pump to force the water through the membrane and a storage and re-pressurizing facility. Water treatment can be a mystery to many people and it is definitely a very extensive technology which requires knowledge and careful selection to be sure that the applied treatment is correct. 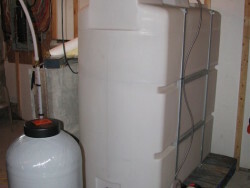 Very often whole house reverse osmosis is the only practical solution. A home in itself is a very substantial investment and the water quality represents a major portion of the value and comfort of your home. Before identifying a whole house reverse osmosis system is what is needed for your home or facility, we will need an extensive water analysis. Since the equipment available is very extensive and we guarantee results, we need to be sure that we are applying the correct unit to your particular water problem. We will help you if necessary, in procuring your water analysis. Sometimes the experience of digging or drilling a well might lead to frustration and heavy cost because the resulting water is not acceptable for household use. Conventional treatment is considered, but even these methods will not always deliver long term results. If we, at Atlantic Water Treatment Technologies are approached with a water problem which might be deemed as treatable with reverse osmosis, we will recommend an extensive water analysis before proceeding. We do this, so that we can make a determination of what the best form of treatment may be. If reverse osmosis is considered practical, we need to decide on the form of reverse osmosis, as membrane type, size, pre-treatment etc. Because some of our customers are through with drilling into the same pot, “Whole House Reverse Osmosis” is most often the only practical solution. Many people find water treatment very foreign to them and they do not wish to tread into the unknown. 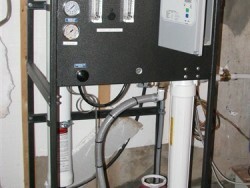 I have put together images outlining a recent installation of a typical reverse osmosis unit. I am hoping that this might give you an idea of what equipment is involved and to outline how dramatic the results are of installing a unit such as this. With the customer’s permission, we have outlined pictorially this installation. This customer, is very satisfied with the results and has invited us to refer to his unit whenever we encounter potential reverse osmosis customers. 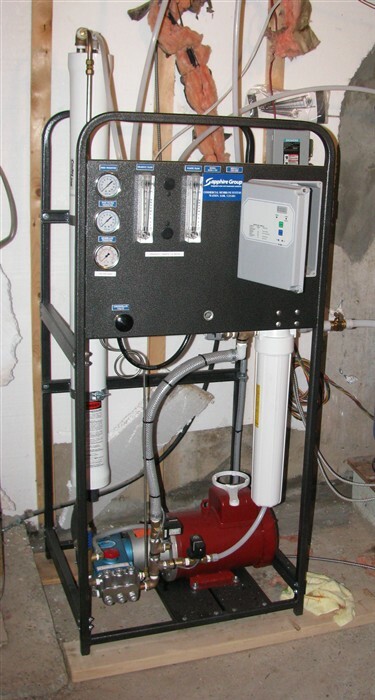 A typical Whole House Reverse Osmosis installation includes a water storage tank, Reverse Osmosis Monitoring rack with components, and the actual Reverse Osmosis unit that converts salty, ocean-like water into potable water without the presence of extreme minerals. Atlantic Water Treatment Technologies designs and adapts the systems according to each customer’s needs. Reverse Osmosis rack with the components, the RO pump, membrane flow meters, pressure gauges etc.